Kerstin Anderson, as Maria Rainer, and the von Trapp children in the on-stage musical "The Sound of Music." 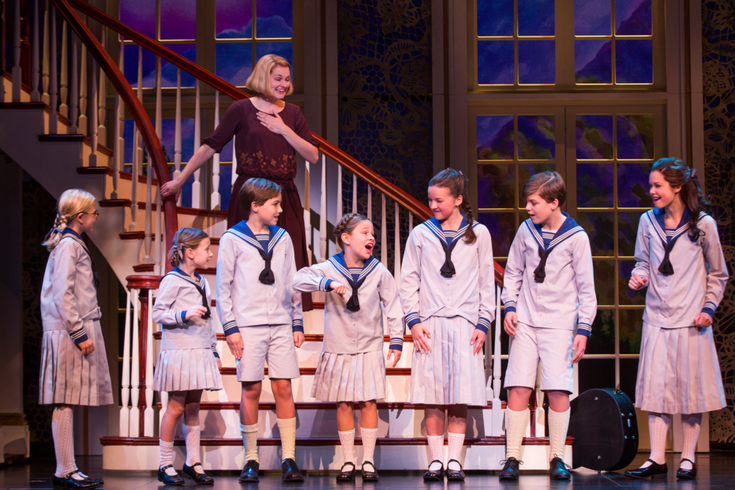 Beginning Tuesday, March 15, "The Sound of Music" theater production will have an eight-show run at the Academy of Music. The show is currently on a national tour through 2017, but the March performances will be the only Philly dates. The film version, which recently celebrated its 50th anniversary, continues to be among the most successful movie musicals in history, which is not surprising since almost all of the songs ("Do-Re-Mi," "So Long, Farewell" "My Favorite Things," "Maria") were instant classics for viewers. The original music by Richard Rodgers and lyrics by Oscar Hammerstein II will be used in the new theater production. As for the cast, the national tour stars a fresh face as Maria Rainer. Kerstin Anderson will play the leading role, with Broadway's Ben Davis as Capt. Georg von Trapp and Ashley Brown, who also performed in NBC’s "The Sound of Music," as Mother Abbess. "The Sound of Music," based on the true story of the von Trapp Family Singers, tells the story of a postulant at an Austrian abbey who becomes a governess in the home of a widowed naval captain with seven children. Tickets for the show begin at $20, and the Kimmel Center notes that Tuesday, Wednesday and Thursday evening performances have the best availability.